Recent declines in the spawning runs of river herring in the Oyster River have prompted Fish and Game to close this river to the taking of river herring by any method from the head-of-tide dam at Mill Pond in Durham to the mouth of the river at Wagon hill Farm and Durham Point. A map that corresponds to the extent of this closed area can be found on page 24 of the 2012 NH Saltwater Fishing Digest in the shellfish section. The coordinates for the Oyster River shellfish closure and the river herring closure are identical and are identified in red. The Gulf of Maine Cod Spawning Protection Area is located south of the Isle of Shoals and was implemented in 2011 to protect large aggregations of spawning cod during the spring. The area is closed to the use of recreational and commercial gear capable of catching cod between April 1 and June 30. A map of the Cod Spawning Protection Area can be found on page 9 of the 2012 NH Saltwater Fishing Digest put out by Fish and Game and on the web at www.fishnh.com New rules allow fishing within the state waters portion of the Gulf of Maine Cod Spawning Protection Area with hook and line and an artificial weight or single lure weighing one ounce or less. The rule provides anglers with the opportunity to fish for pelagic species such as mackerel while still prohibiting the use of gear that could catch spawning cod. Any vessels transiting through this area must have all hooks and bait removed from fishing rods, commercial vessels must have all gear stowed, and any groundfish on board the vessel that were caught outside this area must be gutted. The taking of sea-run salmon is now prohibited in coastal/estuarine waters. Any salmon caught must be released immediately. The area 50 feet above and 200 feet below the fish ladder at the Wiswall Dam on the Lamprey River in Durham, N.H., is closed to all fishing between April 1 and July 31. The lower closure equates to roughly the end of the granite wall on river left, and a USGS pin on river right. Signs will be posted. Please note that because these rules went into effect after the 2012 NH Saltwater Fishing Digest went to print, they are not included in the publication. 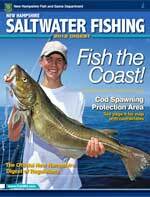 The Digest is a good resource for information on other marine fishing rules. Download it at www.fishnh.com or pick up a copy at any Fish and Game Department office or licensing agent. The New Hampshire Fish and Game Department is the guardian of the state's marine, fish and wildlife resources and their habitats. The Department's Marine Fisheries Division is located in Durham, N.H. Visit www.wildnh.com/marine.